Every day my two sons walk from the school bus stop to the house. I made sure they each have their own key to the house so they can get in if there’s an issue. They also have a mandate: call me the minute you walk in the door. That could be if their sister beats them home from her bus stop or if she’s there with them. Most times I get a partial dissertation of the day. It wasn’t an easy transition this school year. First year at a new school, first year riding the bus, too. They started the school year calling and if I didn’t answer – and bear in mind I’m at work – they would call again…and again…and again…and again… It was at the point that if I was in the middle of an interview the vibrating phone would start to bleed onto the microphone. I had to say “if I don’t answer in two attempts eight more won’t make me answer more!” If something was wrong I told them to keep calling so I know there’s a problem. If they do it over and over again I worry. Today the phone rang. Repeatedly. Everything goes through your mind then. One of them fell and broke a limb. Some guy in a rusted white van tried to grab one of them. One of them never showed up and is still standing on the corner at school. Aliens abducted them. Something had to be wrong. So after finishing my work call I answered. It was something like call number 8. “We didn’t have such a great day,” was the answer. It was then I realized that, even though we have had enormous changes and massive cuts in finances and a major diminishing of gifts, parties, Christmases and other events . . . a kid’s life is still one where the tiniest thing can sometimes spoil them. I was bewildered, bowled over, taken aback, and a few other adjectives starting with the letter “b”. The funny thing is . . . I’d made cookies, those are them, up on that plate. But the problem was actually created by their own actions. 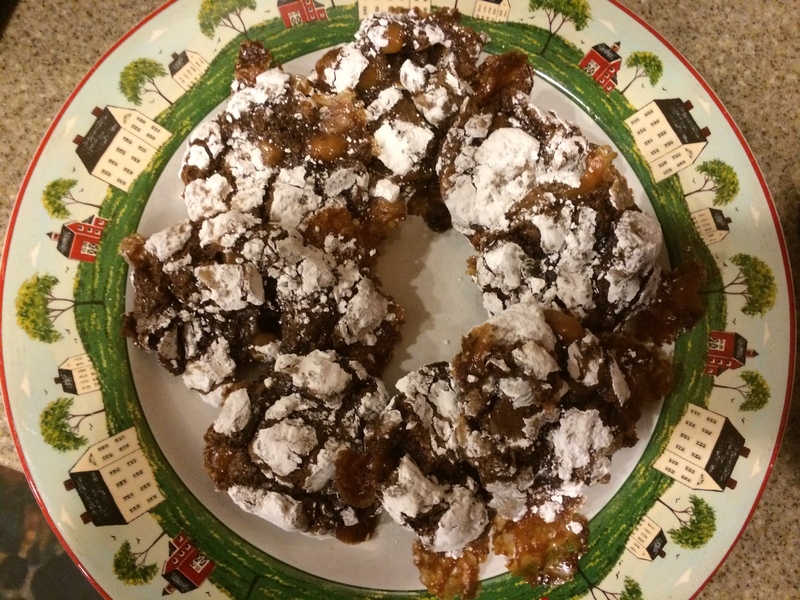 Those chocolate crinkles with caramel bits mixed in were on a plate the day before. Upon their entrance to the house they devoured the entire batch. So as a result, when I made their lunches, I had to make another batch of cookies. That required cooking them around 9pm and as I finished them I had to let the cookies cool. It was then I had to go do a couple loads of laundry and get dinner for the next day ready. So, with the lunch boxes in the fridge, I forgot. There. I said it. “Did. . . ” this is where they interrupted me. I hadn’t realized that. Guess I hadn’t. So I apologized but told them there was a whole plate on the counter and they could each have one. Which they did. But when I got home the plate was empty. One, I said. Apparently the locusts arrived and ate the rest. I managed to inform them, gracefully, that a lack of a cookie isn’t an emergency. I also informed them that cookies aren’t a necessity, either. I should, by all accounts, put an apple or banana or other fruit in their lunch. The distaste on their faces showed me I was right. Suddenly I didn’t feel so bad myself.